There’s nothing quite like gathering around a warm, crackling fire pit with friends and family. Fire pits provide a rustic and comforting atmosphere for people to gather around and enjoy each other’s company. 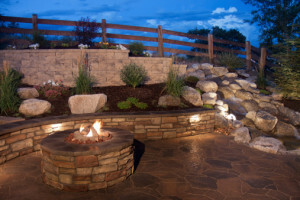 Adding a fire pit into a landscape design has become a huge trend that many people desire. In fact, according to a survey conducted by the American Society of Landscape Architects, fire pits are expected to be the number one outdoor design element of 2015. When considering fire pit landscaping ideas, it’s important to consider location and size, as well as fuel options. possible to your home or outdoor living space to be conveniently accessed, but not too close for safety reasons. Fire pits are great landscape design elements because they can be a standalone feature, so don’t be afraid to place a fire pit on its own. Another great option is to strategically place the fire pit so that it can be seen from an inside living space, so it can be enjoyed indoors and all year round.When determining the ideal location for a fire pit, it is important to keep convenience, space availability and safety in mind. You will want the fire pit as close as possible to your home or outdoor living space to be conveniently accessed, but not too close for safety reasons. Fire pits are great landscape design elements because they can be a standalone feature, so don’t be afraid to place a fire pit on its own. Another great option is to strategically place the fire pit so that it can be seen from an inside living space, so it can be enjoyed indoors and all year round. Once you determine the best spot for your new fire pit, you will want to consider size. Fire pits can range in size from a small portable pit to a large and extravagant outdoor fireplace. Choosing the size for your fire pit will largely depend on how much yard you have and how much space you will want to dedicate to this design feature. You will also want to consider it how many people you plan to accommodate, the room you’ll need for outdoor seating and unrestricted traffic flow when determining the right size fire pit for your yard. 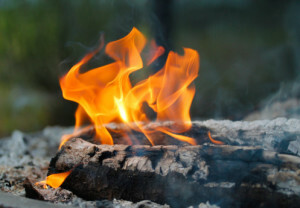 Determining what kind of fire pit you want based on different fuel options is the next step. The four main types of fire pits you can install are wood, gas, propane, and ethanol, according to Hub Pages. Each have their pros and cons, but it is largely up to the homeowner’s preference to determine what kind of fire pit will be best suited for them. Wood burning fire pits are the original and most traditional form of backyard fire pits, and certainly have the most universal appeal. Wood burning fire pits can range from a simple do-it-yourself project to more extravagant stone features. Natural gas fire pits are a popular choice because of their convenience and safety. There is essentially no waiting time for flame production; however you do not have the option for portability because a gas line must be installed. Propane fueled fire pits offer the ease of instant flames by the turn of a knob, like natural gas fire pits, but also can be portable and do not need a gas line. This option is ideal for homeowners looking to add a fire pit to an existing patio or special area which includes an already installed stone work base they don’t want to tear up. This is the most environmentally friendly fuel option but also the most expensive. Ethanol is a biofuel, and is clean burning, odor free, and produces zero air pollutants. The set-up is essentially the same as other gas fueled fire pits, but it does not require a gas line. Not only do fire pits provide warmth, light, a cooking source, and ambiance, they are a natural gathering spot for socializing, entertaining, and relaxation. Fire pits can also be impressive focal points in a landscape design. So, ready to install a fire pit into your landscape design? Contact the experts at Greener Horizon, they can help determine what fire pit will be best for you, as well as design and construct a beautiful fire pit that ties in perfectly with any landscape design.